Home / Uncategorised / Welcome Jamie! We’re delighted to introduce the newest member of our team, Jamie, a fabulous Massage and Holistic Therapist. He is offering a wonderful new set of treatments compromising of Hot Stone Massage, Deep Tissue Massage and Indian Head Massage. 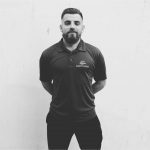 Jamie is also looking to further his studies in sports massage and already has a wealth of knowledge in martial arts, strength and conditioning, yoga and nutrition. Jamie joins us from the incredible Award Winning Laroma Therapies situated in Worthing Town Centre. He will share his time between Laroma and ourselves, joining us in clinic on Thursday and Fridays. We are looking forward to this being the start of a very exciting venture so, to celebrate, Jamie is offering a fantastic introductory offer – £5 OFF your First Treatment! Choose from Swedish Massage, Hot Stone Massage, Deep Tissue Massage or Head Massage. Mix and Match – 2 x 25 Minute Appointments! !